Dr. Daniel Acsadi is Director of Music at Powers Music School, where he teaches guitar and guitar ensemble. Dan is an active arts executive, educator, and performer in the Boston area. 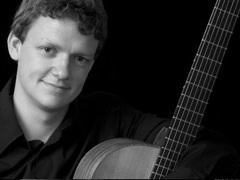 As Director of the Boston Classical Guitar Society (BCGS) for seven seasons, Dan has managed the growth of New England’s most prominent guitar concert series while connecting the region’s professionals, students, aficionados, and audiences through innovative programming and projects. For the annual BCGS New England Guitar Ensembles Festival, he has commissioned new works from Andrew York, Roland Dyens, Carlo Domeniconi, Dusan Bogdanovic, and Clarice Assad. Dan frequently performs solo and chamber recitals, appearing at Boston’s Jordan Hall, Trinity Church, King’s Chapel, Pittsburgh’s Heinz Hall, New York City's Roger Smith Arts, and numerous regional concert series. He often plays his own arrangements, many of which originate from Hungary, his country of birth. Dan passionately believes in the guitar’s versatility and universal appeal as a means to break down barriers and unite people through our fundamental love of music. Dan holds Doctor of Musical Arts and Master of Music degrees from New England Conservatory and a Bachelor of Arts from Cornell University, where he double majored in economics and music. Dan’s principal teachers have included Eliot Fisk, Pablo Cohen, John Hall, and Alexandre Pier Federici. He has performed in masterclasses with Leo Brouwer, Manuel Barrueco, and Eduardo Fernandez. In addition to his work at Powers, Dan is faculty member at Tufts University and Longy School of Music of Bard College.